In hopes that St. Mungo soon would be there. But a miniature sleigh, and eight tiny beagles. I knew in a moment it must be St. Mungo. Now bah away! Bah away! Bah away all!" With the sleigh full of Toys, and St. Mungo too. The prancing and pawing of each little beagle paw. Down the chimney St. Mungo came with a bound. "Happy Bahmas to all, and to all a good-night!" Happy Bahmas everyone and hope you have a great New Year. 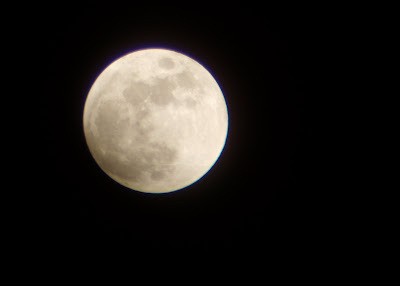 I shot the moon tonight, the night after the lunar eclipse. 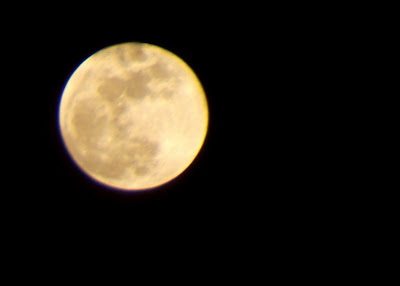 It is a brilliant full moon, and I wasn't able to do it justice. But it is a perfectly wonderful night, and I wish I was camping in the woods with a warm campfire, sitting on a log, covered in a wool blanket. Thought I'd repost this on the eve of the Winter Solstice Lunar Eclipse (which hasn't happened since something like 1650)... We get 2 lunar eclipses each year, but having it happen on the Winter Solstice is apparently rare. Anyhoooo.... have a look and a read below! 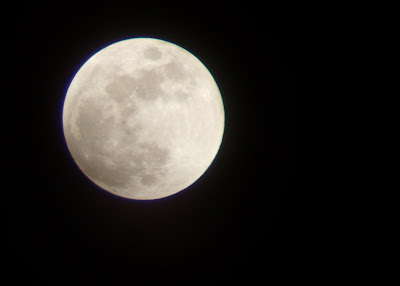 I heard about the lunar eclipse that was happening this evening, so I grabbed my digital camera, my big Nikon 12x50 5.5º binoculars and went out into the backyard. The weather is perfect for taking pictures, with not a cloud in sight. It is cold, and clear. 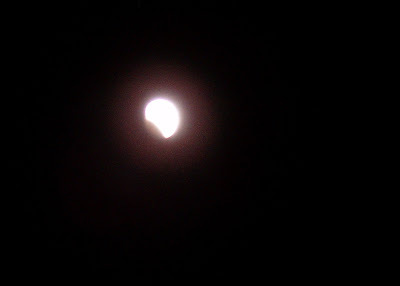 In case you've forgotten (or never really knew, as in my case), a lunar eclipse takes place when the earth gets right in the way of the sun, (i.e. 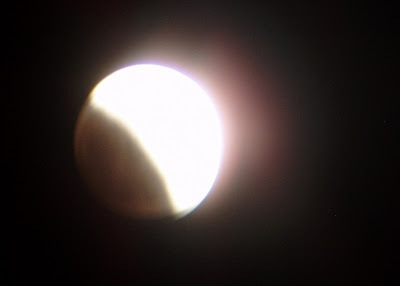 right exactly between the sun and the moon) such that the earth's shadow (lighter shadow is the penumbra, and the much darker umbral shadow appears later) appears across the face of the moon. The blood-red or orange colour is the result of the final bits of sunlight that are able to refract around the earth's atmosphere - the earth's atmosphere blocks the blue light and allows through predominantly the red portion of the spectrum which we see. 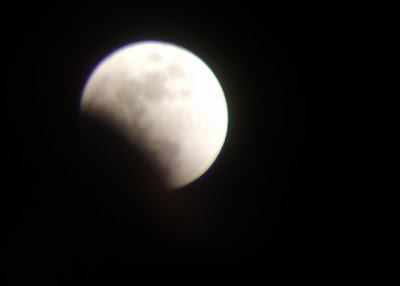 Here in Toronto, the eclipse starts at 8:43 PM and will end just around midnight. 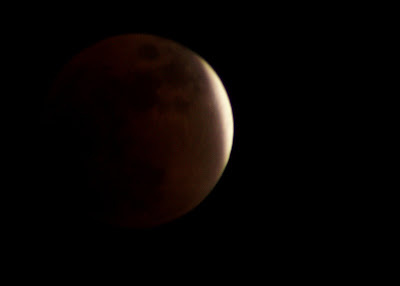 The dark umbral Earth shadow will start to change the moon's colour around 9:00 PM and total eclipse will occur at 10:01 PM. 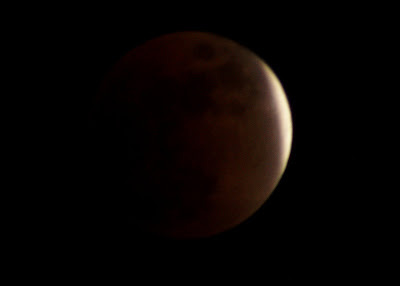 Again, the moon will slip out of the dark umbral shadow and sit in the penumbral shadow until about 10:50 PM. I used a lawn chair as a camera rest on this very cold night (about 15 degrees below Centigrade) and huddled in my pajamas, wrapped in a scarf, hat, 2 sweaters and a coat and shot off a few pictures. At first, most were pretty blurred as it was hard to control holding the binoculars in one hand, resting as firmly as possible on a lawn chair that was unstable on ice coating the bricks out back - and then with my other hand carefully holding the digital lens into one of the binocular lenses... Anyway, it seems to have worked pretty well and I got the hang of it after a while - necessity is the mother of invention so they say. Here is the clearest shot I could take at 7:20 PM - the moon looks rather yellow - it was still about 30 degrees from the horizon and so I think the atmosphere was lending a deeper colour to it. The colour is not related to the eclipse. 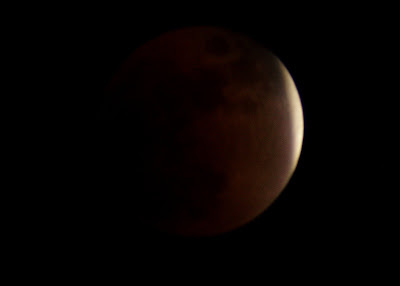 This next one is really clear - I took this and the next three shots at 8:20 PM - the colour had whitened up as the moon had climbed the sky more to about 40º. 8:20 PM again. 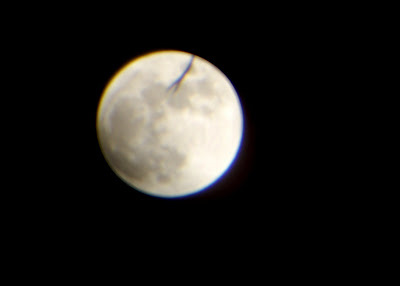 A branch from the neighbour's tree got in the way of this picture - but the combination of the camera lens and binocular really picks up great details of the moon's surface. 8:20 PM again. There is a blueish glow at the top of the moon - caused by the distortions of the lenses, not due to the moon's inhabitants hosting a late night baseball game and using high-powered sodium lamps to light up the stadium. The cold air has made me quite hilarious, you see. I am all a-twitter. I run inside for a moment to tell Spring. Spring is bundled up in bed, and promises to look at the photographs. That means she's not going outside. For a second I see myself as a deranged fool dressed in pajamas with an overcoat looking like Dr. Who. And then the insight goes away as I fumble my way out the back door again. 9:10 PM. The eclipse has begun! For some reason, perhaps because I had to move the lawn chair to a less stable area on the snow, the images are not as clear. 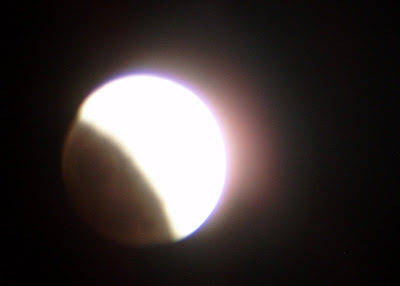 Here though you clearly see the umbral shadow cloaking the brightness of the moon. 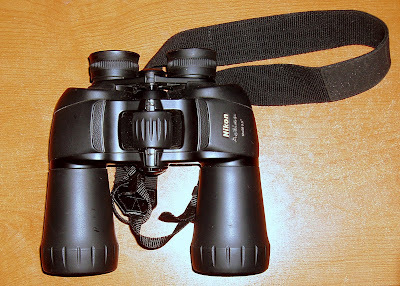 Watching it through binoculars is magical really - quite amazing to observe. 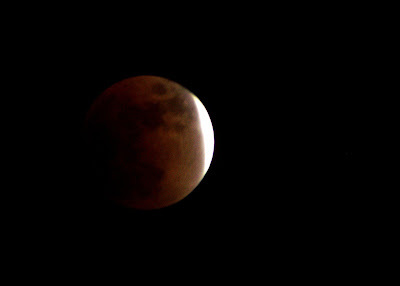 It's as though someone is drawing a dark, heavy cloth across the luminous surface of the moon. 9:15 PM. 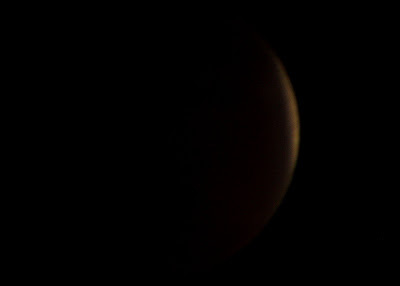 This one is taken without benefit of the binoculars - straight through the digital camera lense. Not great. But shiny. 9:26 PM. 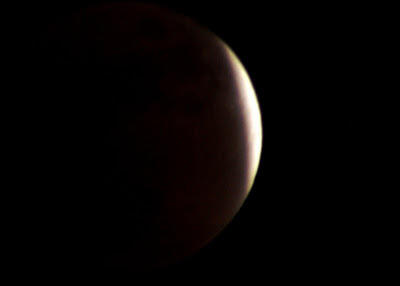 The umbral shadow has occluded about 50% of the moon's surface. I can hear the clattering of doors around the neighbourhood as people duck out into the cold night to see it. Planes occasionally track through the sky - I wonder if the pilots and passengers are looking, or if they are too caught up in the in-flight showing of Die Hard, and gin and tonics. 9:45 PM. Sixteen minutes until full eclipse - it's getting close. My fingers are beginning to freeze off. The pain has receded, only to be replaced with a slightly frightening numbness. My fingers don't work very well, hard to click the shutter button. It was Captain Lawrence Oates on the ill fated Scott Expedition to the South Pole who said "I am just going outside and may be some time" and deliberately left his tent and went out into a blizzard in an effort to save the rest of his compatriots by leaving them with more food. I am not at that stage yet, but it is sure is chilly. 9:47 PM. This one taken without binoculars. Kneeling on mitts in the snow. Knees cold. Monty is now outside running around in the snowy paths that I made for him the other day. He has located his stick and is galloping full bore around the backyard, proud as a peacock. Now he is peeing. Sorry, back to the moon. 9:55 PM. 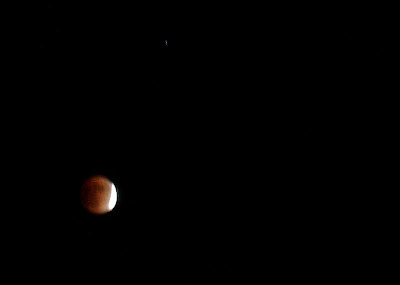 Shadow almost taking up all of the moon - it is looking a lot more dim in the sky, and the stars around it are beginning to show brightly. A dirty orange glow - soothing and a bit scary in a way. 10:00 PM. If you look at these photos, you can really see the 'man in the moon'. Just a slice of brightness remains. Amazing. Well, that was fun. I'm inside now, my fingers have warmed up, and I'm getting tired. Time to go to sleep and hope that the moon returns from its eclipsed state and that the sun rises in the morning and that everything goes back to the way it is supposed to be. I had all the ingredients needed in my basement: 600 grit wet and dry sandpaper, double-sided carpet tape, a scrap of wood for mounting the sandpaper, a cutting board (another scrap of wood), a pencil and a piece of paper. First of all, I applied two strips of double-sided carpet tape to the wood, ensuring the application was nice and flat. That is, I didn't overlap the tape, just kept the joint between it very close (about a 5th of a millimeter at most). This is a pseudo-action picture, showing the tape cover being removed in a curly manner. Just imagine the fervour with which I was removing the cover strip. Close your eyes, and imagine. Okay. You're done. Then I traced the wood with a mechanical pencil onto the rough side of the sandpaper. I could have done this prior to the previous step. It isn't that complicated. You'll see. Trust me. Then I carefully and evenly adhered the sandpaper roughly positioned over the wood. The tracing line was just to ensure I didn't miss any area of wood. You don't want any raised areas under the sandpaper. I should have mentioned earlier that the board needs to be nice and flat, absent of any dents, bumps or hiccups. I flipped the wood over - and using a sheet of plywood - trimmed the sandpaper cleanly to the edges of the board. Flip it over and admire your precision achievement, as I have done above. Admire. Tidy up the bottom. This is another action-shot. I carefully staged it. Create a paper template and draw a handle shape on the bottom part of the wood. As above. Fold the paper over to make a symmetrical handle shape. Or do it free-hand if you are feeling wild and crazy. You may now dispose of the paper template, or recycle it. Now cut the handle to shape. Use your knife. 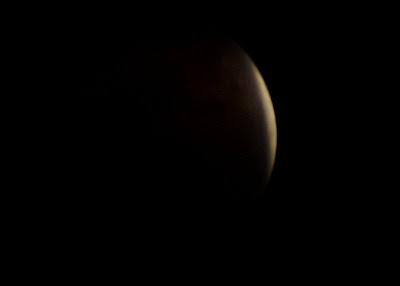 Even though it isn't as sharp as it will be soon. You can drill a hole in the handle and attach a lanyard to it. You can sand the handle smooth and apply some oil to stain it. You can apply gold leaf to it to really jazz it up. The final step is to use it. Wet the paper. I held mine under the bathroom tap and sharpened the knife there. Stop the water flowing, and let a slurry of metal paste build up as you slowly work the blade over the paper. The speed with which you stroke the blade over the abrasive is much less important, as holding the bevel is carefully to the surface. You'll get faster over time. You'll need to stroke the knife probably 30 times per side. Then it will be ready for stropping on a leather strop (I use an old belt, tied to the wall). Stropping will remove the 'wire' that builds up on the edge as a consequence of sharpening or honing the blade. A good sharp knife can slice through a piece of typing paper with no additional pressure other than the weight of the knife. Also, you know the knife is ready for surgery (seriously), cutting meat, shaving, or cutting wood if you can shave hair with the blade from a wet forearm painlessly. You'll only need to touch the blade up from time to time after this. If you have any questions, e-mail me or leave a comment below. Went for a nice hike into the valley behind our house around lunch today. The sky was clear, and it was accordingly cold. Few signs of animals, a few red squirrels scampering about. Chickadees, Cardinals, and Robins flitting amongst the trees. The river was beginning to freeze up. I unpacked my napsack, and laid out my wool blanket. I brought a saw, some bread, evaporated milk, my stainless steel camping mug, my Mora 510 blade, a Light My Fire mess kit (the green item in the back), a kettle, along with a Trangia alcohol stove, a Nalgene full of water, my arctic mitts, some pre-cooked rice in a bag, and some curry in a bag. I also brought some fatwood slivers and some cotton impregnated with vaseline for a firestarter. First order of business was to make a cup of tea. Then using the remaining water, I heated up the rice and curry. I used my saw to cut dead wood up and make a big fire. Soon the food was ready, and I carved a simple utensil to eat it all with. I sat and enjoyed myself for a while - I was nice and toasty. I was wearing wool socks, wool pants, a wool sweater, my shearling hat, and gloves with hand warmers in them (the ones that contain iron oxide, charcoal and salt). When my tea cooled down, I heated it up and added some more water. After about an hour, I rolled up my blanket, and began to pack things away. I don't have a proper outdoor saw (other than a largish bucksaw which requires assembly - not great in the cold), so I brought my tool set specimen. I think for Christmas I'm going to ask for a folding saw. In a wink, I was ready to go. I made my way back past the rushing stream and came home. A nice walk on a nice day.